A Connection for Peter of Münchsteinach? One of the things of which I am most pleased to have done in these pages is to have connected the Hasselbacher and the Hazelbaker family lines together. Thus it is that Peter Hasselbacher/ Hazelbaker, the first ever Hazelbaker, is my Half 3d cousin 7x removed. The Hazelbaker family has had an assembly of wonderful family historians of its own, but I have not resisted making contributions when I could. Thus, I had speculated that the family story that Peter was conscripted into the British Army from the village of Ansbach might have been a misinterpretation derived from the official name of his unit: the Ansbach-Bayreuth Regiment. 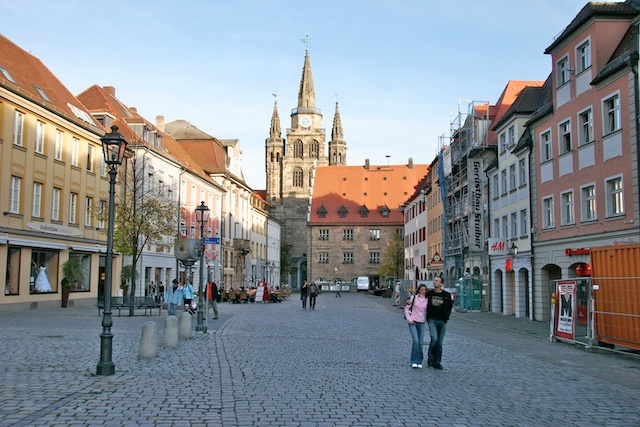 After all, Ansbach was some distance away and I knew of no connection between the Peter of Münchsteinach and the town of Ansbach. At least one other element of the story appeared incorrect– that Peter was the only son of his mother. While my speculation may still be valid, it is no longer correct to say there was nothing to connect Peter with Ansbach. A reevaluation of a document that has been available for some time makes it clear that there were Hasselbachers in Ansbach. The dates are such that it is possible they were there by 1777 when Peter was conscripted. 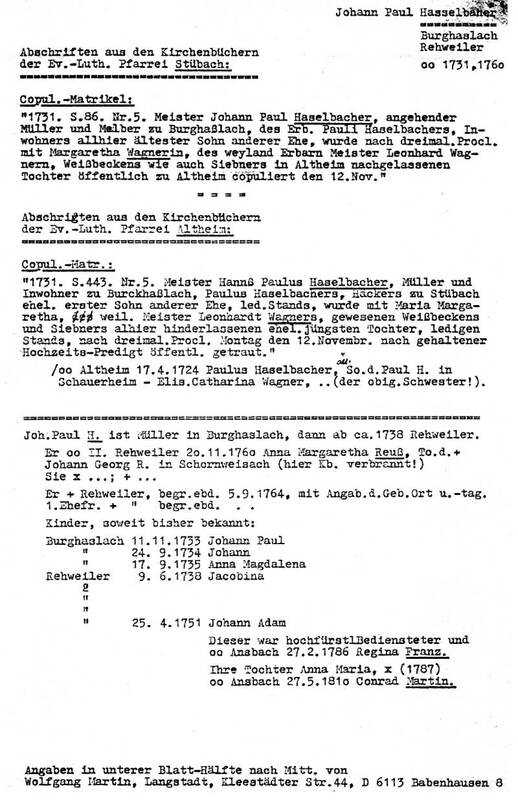 The document from the Blatter für Frankische Familienkunde, 1979 is reproduced and partially translated here. I collected it in 2005 at the GFF in Nuremberg. I had no German at the time and could not explain of Wolfgang Martin's interest in the Hasselbacher family. The genealogical information at the article's end seemed to duplicate that which was available from other sources. I put the journal on the back burner and only now brought it out again as an exercise for my German lessons. The fact that I can make a little sense of the German and have a larger framework into which to place the information made a tremendous difference. The special reward for me is that the family connection to Ansbach involves my 8th Great-grandfather, Paulus Hasselbacher of Stübach, and historic events of which he was a part. The original Peter had a contemporary cousin, Johann Adam Hasselbacher who was born in Rehweiler in 1751 but moved to Ansbach before 1786 where he established a family line that led to our newly discovered distant cousin, Wolfgang Martin. (See family tree) Johann Adam was 8 years older than Peter. His father, Johann Paul Hasselbacher, was born in Stübach, one of my ancestral villages and just over the hill from Münchsteinach. Johann Paul left Stübach and became a master miller in Burghaslach where he began his family before moving to Rehweiler between 1735 and 1738. 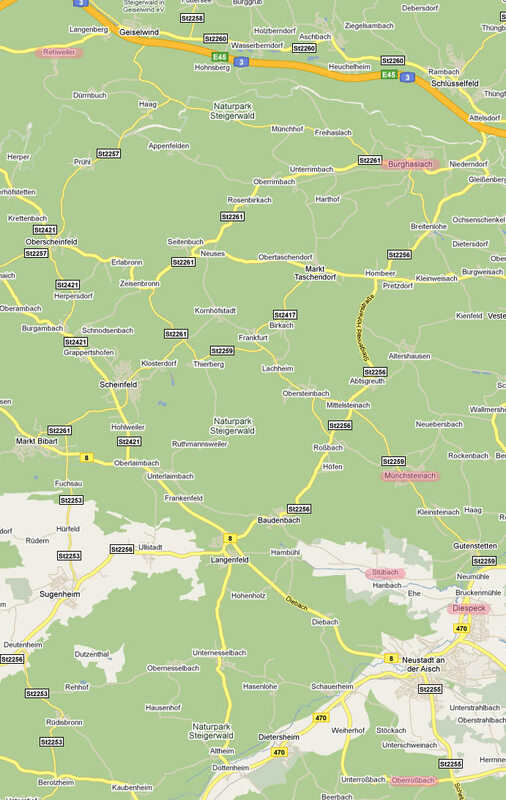 (Click on thumbnail map for locations of these places.) 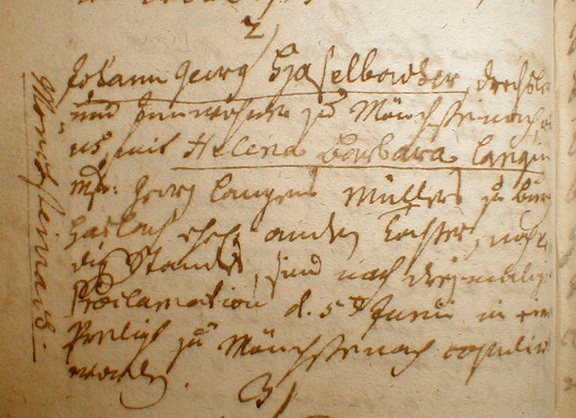 It may not be a coincidence that Peter's mother was born in Burghaslach, indeed the fact seems inescapable that Helena Barbara (Lang) Hasselbacher knew the family of her future husband in Burghaslach: her father Georg was also a master miller in that place! It must remain a distinct possibility that Peter Hasselbacher the Soldier may have been conscripted from Ansbach. He had family there. As a younger son, he may well have had to look elsewhere than Münchsteinach to practice his trade and start a family. Ansbach, but perhaps not Münchsteinach, had a town square (see above) and a population large enough to serve as a recruiting site to line-up and measure prospective soldiers as the family story relates. Someone needs to visit Ansbach and look through their church and civil records. In those times, it was common to require newly arriving residents to register with the civil authorities. Perhaps such records will hold a surprise for us! No matter what the truth is, we now know of a new German line of Hasselbacher descendants who lived in Ansbach. I hope to find out more about them!